I've always enjoyed visits here as it is an unspoilt oasis amid the uncontrollable gentrification afoot in the area. The guy behind the bar was old time East End through and through and in possession of gentlemanly manners while the two ales on were in great condition. Quite between Christmas and New Year and I'm sure it attracts a few geezers needing excitement as well as possible extras from the Pulp song, 'Mile End' but for me, a good place. This pub is so nice and unique and is separated in two halves like most pubs were in the old days. It is a Jazz pub and this is apparent made by all the photos above the bar by various Jazz artists. I do like a little bit of Jazz so is ok for me. Th actual pub is like a walk in relic and could easily have not been touched since the 50's, although is still clean and cozy. I am a beer and crisp man normally, but for some reason when ever I go there I have an urge for Guinness and Twiglets lol. The punters are a mixture of locals and students, both of whom are well behaved and polite. It is also by the canal and a nice bit of green, so a place to go in the summer too. May even go later on today if I can persuade a mate or two to join me. Just a little bit pricey and when one half of the bar is closed the far side, then doing a number 2 is not an option here, unless your polite to staff to open it quickly to use. I had a most enjoyable couple of lunchtime hours in this pub and the landlord was most welcoming and projected a sincere warmth throughout my stay there. Not being from the area or indeed the East End it would be nieve of me to begin to understand the complexities of a pub such as this but i would suggest an open minded approach should you choose to visit. 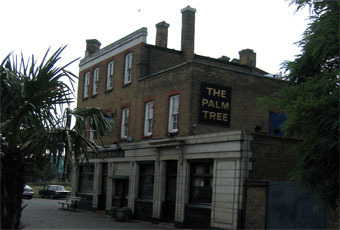 Public Houses such as the Palm Tree are in my opinion very special places especially to local people and this should be borne in mind when visiting from outside the area. This would not be a pub for everybody but that should not be taken as a criticism of any kind. It is primarily a pub for local people and that ought to understood and respected albeit i have no doubt that visitors will appreciated and welcomed as i was. Absolute gem. A timewarp in the best way from the characterful curved bar to the old gold wallpaper! 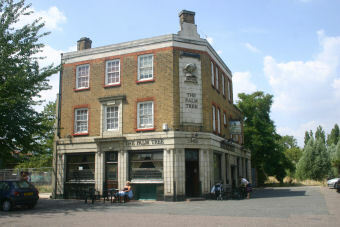 Good beer, friendly welcome from regulars and landlord alike. SATURDAY NIGHT 26-02-2012, POST DINNER-AT-HOME-DRINK WITH A MATE & HIS WIFE & A FRIEND - ALL TO THE PALM TREE. JAM PACKED WITH SOME BEAUTIFUL GIRLS, COOL GUYS, LIVELY, VERY NOISY CONTEMPORARY ATMOSPHERE. GET TO THE BAR. BRIGHT BAR LAMP AT MY EYE HEIGHT, I TOUCH IT ADMIRING IT. SHORT BARMAID WITH BLACK HAIR SNARLS & HYSTERICALLY SCREAMS SOMETHING UNINTELLIGIBLE AT ME FOR DOING SO, TURNS TO OLD WHITE-HAIRED GEEZER BEHIND HER & RANTS AT HIM. I APOLOGISE, TAKE MY DRINK OFFERED BY MY MATE & BACK OFF/AWAY -NOT CONFRONTATIONAL, ME- ALSO TO LET SOMEONE ELSE SQUEEZE PAST INTO THE ALMOST NON-EXISTANT SPACE I LEAVE. FIND MYSELF NEAR DOOR HAVING DONE SO. NEXT THING AM ON THE GROUND IN THE CAR PARK BEING KICKED & PUNCHED BY THE OLD WHITE HAIRED GEEZER & 2 OR 3 OF HIS MATES -HAVING COVERED MY FACE I'M NOT SURE IF IT WAS 4 BUT IT WAS DEFINITELY ATLEAST 3..
AFTER ABOUT A MINUTE, THEY BACK OFF & DISAPPEAR. 40 PEOPLE -MORE OR LESS- WATCHED & DID NOTHING EXCEPT A BEAUTIFUL BLONDE(? )GIRL IN A GREY FUR COAT WHO, AFTER I GET BACK ON MY FEET SHOCKED, BEWILDERED, BEGINNING TO BECOME ANGRY & SHOUT 'WHY ?' AMONGST OTHER THINGS -INCLUDING MY FRIENDS' NAMES FROM THE CAR PARK ON THE OFF-CHANCE THAT THEY MIGHT HEAR ME OVER THE DIN INSIDE- ASKS ME IF SHE CAN GO & GET MY FRIENDS WHO I START TO DESCRIBE BUT, WHILST DOING SO, MY MATE CAME OUT LOOKING FOR ME BEFORE SHE NEEDED TO GO IN. I THANK HER FOR HER CONCERN & RELATE WHAT HAPPENED TO MY MATE TELLING HIM I'M LEAVING BUT MY PHONE IS AT THEIR HOME. I SUGGEST HE GOES TO GET HIS WIFE & WE LEAVE UNDER A TIRADE OF ABUSE FROM HIS MISSUS WHO MIFFED AT HAVING HER BINGE INTERRUPTED. IF THIS ANTIQUATED VIOLENTLY DODGY OUTFIT -RUN IN THAT MANNER BY PEOPLE WHO WOULD PERHAPS BE BETTER OFF RUNNING AROUND IN CAGES WITH COLLARS ON AT A VICTORIAN SIDE SHOW INSTEAD OF WORKING & MAKING LOTS OF RELATIVELY EASY MONEY IN 2012- IS SHUT DOWN SOON, DO NOT BE SURPRISED. IF THIS PLACE -WHICH HAS ITS OWN PERSONAL '666' IN RAISED LETTERS ON THE PLAQUE ABOVE THE DOOR IS ERADICATED FROM GOD'S EARTH SOON, AGAIN DO NOT BE SURPRISED. I HAVE INFORMED THE POLICE.